Solo Show Opening- Also, Hamburg! 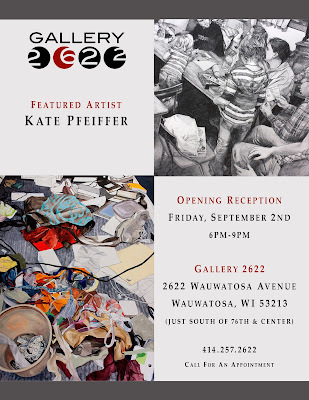 I'm excited to announce the opening of my first solo art show at Gallery 2622. The show will feature never-before shown work, including all of my latest paintings and sketches and some work that has not yet been shown online. I will be there for the entire opening and would love if you could drop in to see my work and say hello. There will be refreshments and plenty of awesome art to look at! Everyone is welcome so please inform art-lovers and bring your friends. I hope to see you there! If you are unable to stop in for the opening, the show will be up for the entirety of September. If you'd like see the show after the opening reception, just call gallery at 414.257.2622 to let the owner, John Korom, know you're dropping by. Additionally, for those of you who read this blog and also live in Germany (hundreds of you, no doubt), the album cover I submitted to the AMOS Showtime project will be shown alongside hundreds of others at the museum Beatlemania, located in Hamburg, from September 16th through December 31st. Address and contact information for the museum is located on Beatlemania's very German website, which I won't pretend to be able to read, despite my German genes and love for sauerkraut. I hope to see you at my solo show, and if you somehow attend my German show, shoot me an email and let me know how it went!